Instead of selling your old home and buying a new house, you decided to have your house moved from its current location to an area of land you purchased. 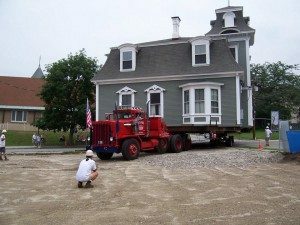 Before you begin deciding on moving an entire house, you need to make sure that the house can be moved safely without damage and that you have the proper permits and licensing to do the job. A house moving permit can be obtained after inspectors have come to the home and assessed it. Once the inspectors are satisfied that the house can be moved, you can apply for a permit to have house moved to a new location. In addition, you will need a permit for a new foundation. Make sure that you have all the permits available before starting to move the home. Building codes vary from state to state, and you will need to ensure that you are compliant. You should also ensure that the company moving your home has an appropriate house moving permit as well as a license to do business. The regulations concerning which movers get a permit and how to obtain one vary from state to state. It is essential that you make sure that the company and all the people working on the project are insured. This will protect your investment if there is any damage to your home in the process of moving, and it will also protect those who were working in the transport of your house. Hiring professionals usually means you do not need to worry about damage while moving, but it is also helpful to ensure you and your possessions are thoroughly insured. If you have received a permit to move your house and did not undertake the project immediately, make sure that your permit has not expired when you finally decide to move to a new location. Keep all of your permits and licenses up-to-date, hire the right professionals and you’ll be ready to start the moving process. To learn more about the specific moving permits required in your state or town, contact us at Payne Construction Services. As professional building movers who have moved structures all over New England, we know the permits and regulations required by each state and can let you know what you need to get started. Call us today or click here for a free quote.